The Giveaway is over, but please read on for a fabulous recipe from Tim Vidra! We were so pleased when Tim Vidra, The Farm Table’s Twitter and Pinterest guru, agreed to do a guest post for us on our blog. Many of you know him already as the author of the E.A.T. blog, where he shares many of his food inspirations, and advocates using simple, and local ingredients. We think that if you are invited to his house for dinner, you are one lucky person. In our house I do most of the cooking, and for this guest post I am going to have to give credit where credit is due — my better half came across a variation of this seasonal tart recipe in one of her Real Simple magazines a few years back. Now for me, Real Simple is not a magazine I frequent and it certainly wouldn’t be the first source for recipes I’d lean on — well here I am a couple of years later continuing to make this easy, tasty, and very eye appealing tart that I know you will also enjoy. 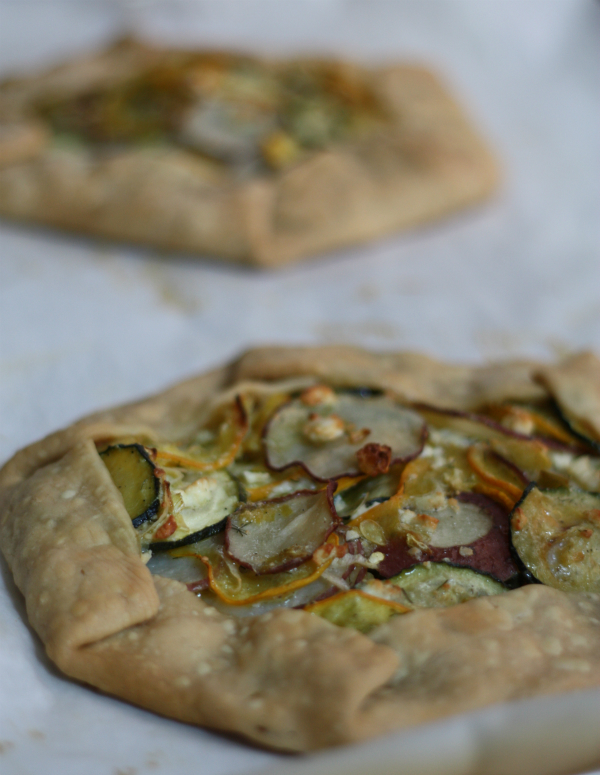 We most recently had all but a few of the main ingredients required for this tart recipe come in our farm table Chef’s Box delivery — squash, zucchini, leeks, and even dill. So with that, you can create this in a few real simple steps! 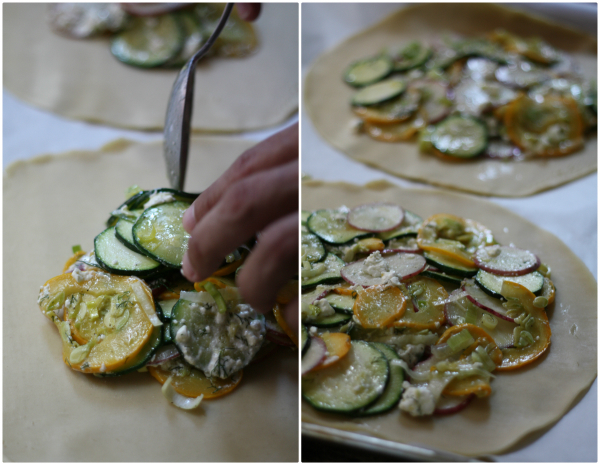 Heat oven to 375 degrees and thinly slice squashes, potato and leek — we use a mandoline on the vegetables to get a super thin and uniform slice (though a sharp knife and steady hand will get the job done). Heat oil in a skillet and cook squashes, leeks with salt and pepper to taste until tender, about 4 minutes. Stir in potatoes, chopped dill and feta and toss to coat everything nicely letting the cheese melt slightly. Roll out pie crust onto parchment lined baking sheet and spoon squash mixture into the middle, spreading out evenly to about 1 inch away from the edges. Gently fold over pie crust sides, one corner over the other all the way around last flap folds over to complete tart edging with open vegetables in the middle. 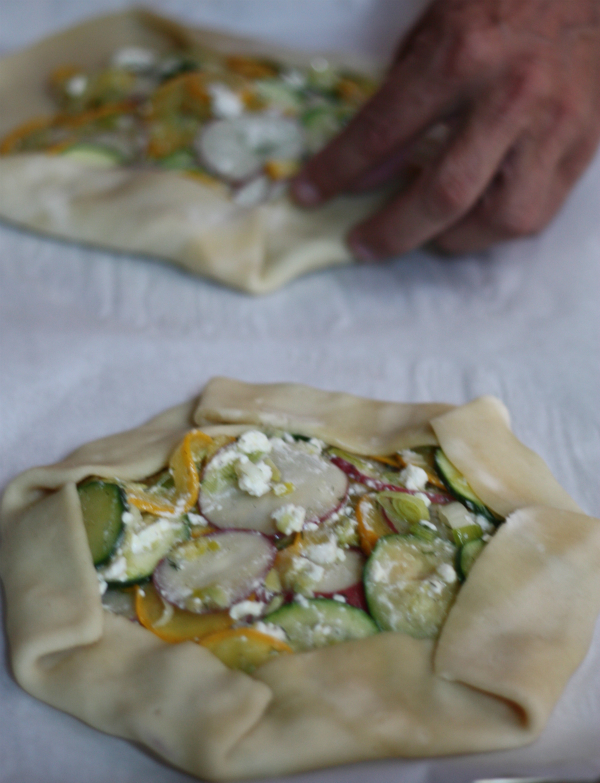 Transfer over onto parchment lined baking sheet and bake for 40 – 50 minutes or until crust bubbles and lightly browns. Remove from oven and either serve immediately while hot or let rest and cool for a more room temperature dish. 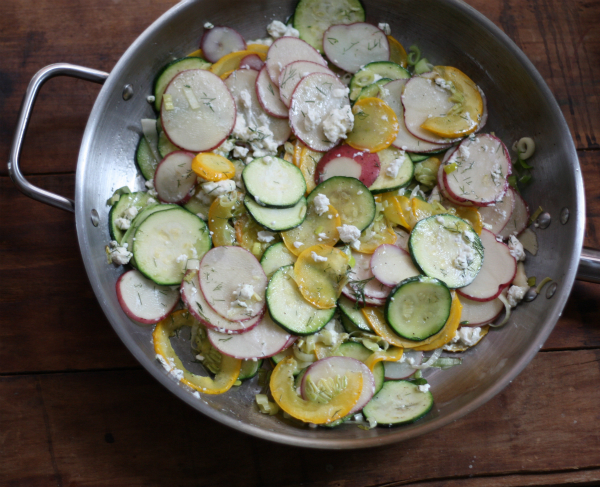 I’d love to hear how you’ve been preparing the vegetables delivered in your own boxes and hope you’re using all of the available free resources of information we have for you here at The Farm Table from the blog, twitter, facebook, and pinterest accounts. The Farm Table is offering a blog give-away to one person in our delivery area: 1 free box of produce and 50% off membership if you are not a member already (membership would be $25 instead of $50). To enter, simply follow The Farm Table Blog by entering your information under “Follow The Tractor” to the right, and leave a comment telling me you have done so. You must include your zip code in your comment so we can confirm your delivery area. “Like” The Farm Table on Facebook , and or follow The Farm Table on Twitter — then leave 2 separate comments on this post for each letting us know you’ve done so. Share this post by clicking the Facebook Like button at the top of the post and leave a new comment on this post letting us know you’ve done so. Tweet about the giveaway including the following: “@The Farm Table and @TimVidraEats is giving away 1 free box of food + 1/2 off membership” with anything else you’d like to include – then leave a new comment on this post letting us know you’ve done so. Follow or visit our Pinterest account and then leave us two separate comments telling us you are following and tell us which board is your favorite. Follow Tim’s blog E.A.T. and comment here letting us know you have done so. Congratulations to Tiffany Coffman, the winner of The Farm Table’s blog giveaway. We hope you enjoy half off membership and your first delivery box of produce on us! Please check your Email or Facebook messages for further instructions on how to redeem your winnings! Virginia based food writer, Tim Vidra, authors the blog E.A.T. where he advocates the principles behind supporting a sustainable food system. Tim’s mission is in sharing his passion for the preparation and enjoyment of food in a way that everyone from beginners to long time foodies can get involved in. Tim’s recipes and advice have been featured across food publications, he writes a regular guest column for Lot18 and he’s led series’ of cooking demos and classes throughout the Richmond area. Learn more about Tim via E.A.T. and follow him on twitter @TimVidraEats.